This release should be well-worth a trip over to the Black Raven Brewing taproom on the Eastside this Thursday. For Great Grandfather Raven, they took their Grandfather Raven Imperial Stout and aged it in bourbon barrels for over a year. Sounds good to me. 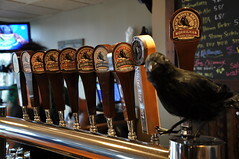 Why not make a trip out of it and go check out the new Bellevue Brewing Company afterward?